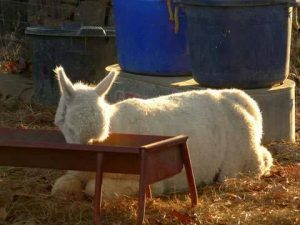 Alpacas can get Lyme disease, but did you know you can get the disease too. May is “Lyme Disease Awareness Month” so I thought I would share our story. It took years of not feeling well before Dave and I found out we both have Lyme disease. We were tired, achy, and forgetful so we thought we were just getting older. The symptoms came on so slowly that we never realized we had Lyme or how sick we were getting. We found out about Lyme disease through a neighbor and realized we needed to see a doctor. The doctor said so many people where we live have it. We live in southeast Oklahoma and never realized this disease was in the area. We thought it was only in the northeastern United States but Lyme is now in every state. So what is Lyme disease? Lyme is a disease caused by the bacteria Borrelia burgdorferi, a spirochete. The bacteria is transmitted to people and alpacas through a tick bite, but some people never remember being bit by a tick. A couple of weeks after being bitten, a bulls-eye rash may appear. Although, there are many people that never get a rash. Please note, contrary to popular belief, the tick doesn’t have to stay attached for very long for the lyme bacteria to go from the tick to their victim. Initial symptoms can include; headache, stiff neck, very tired, muscle aches, and fever, but these symptoms may disappear after a while. The bacteria spreads throughout the body and symptoms will vary depending on where the bacteria migrates to. Since Lyme disease is multi-system, multi-organ disease caused by a bacterial spirochete that can penetrate a multitude of tissues, the list of symptoms is very long so please visit https://www.lymeneteurope.org/info/ for a full list of symptoms plus they have some great information on Lyme. Dave and I had different symptoms from each other so please be aware not everyone has the same symptoms. Lyme disease may be difficult to spot in an alpaca or dog. Even though the alpaca or dog is unable to tell you how they feel, you may notice the animal is tired and lying around more than usual. They may squint their eyes as their eyes become sensitive to light. They may walk with a limp or you may see atrophy in some of their muscles. It is very difficult to completely cure Lyme disease but don’t lose heart. At ILADS, International Lyme and Associated Diseases Society at http://www.ilads.org/ they are doing research and trying to find a cure. They also can help you find a Lyme Literate Doctor, LLD, to help you with your fight against Lyme Disease. It’s a battle so please don’t ever give up. Keep fighting for your health and your life. 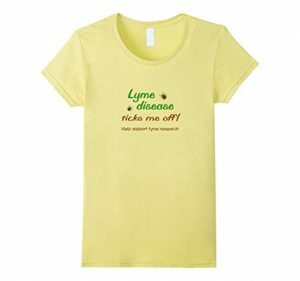 We made some Lyme t-shirts to help people become aware of the disease. However, Lyme research and more Lyme Literate Doctors are really needed so we are supporting research by donating from our Lyme t-shirt sales. For every shirt that is sold, we will donate 50% of the net sales to ILADS to help educate doctors and research so they can find a cure! 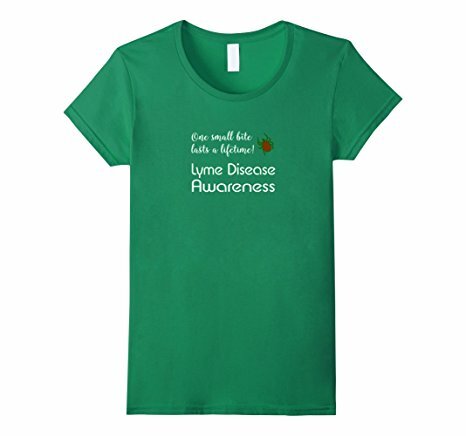 Our Lyme Disease Awareness Shirts are available at Amazon and thank you for supporting the Lyme disease fight!